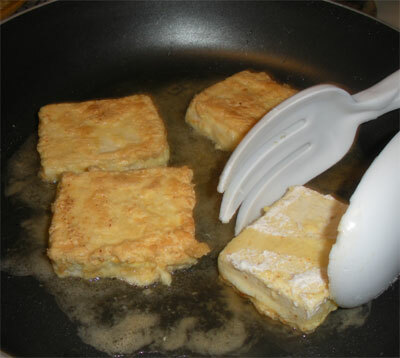 Fried tofu is crispy on the outside and creamy on the inside. Delicious with a veggie stir fry. 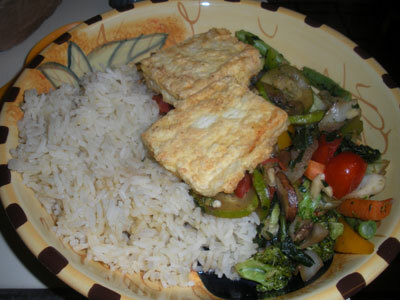 1) Remove tofu that you will use in the recipe from its package. Drain excess water. Then wrap the tofu in a paper towel to absorb excess moisture. Repeat several times. Then wrap the tofu in a paper towel and place a plate on top of it and leave it about 15 minutes. The trick here is to remove the moisture from the tofu. 2) Slice tofu in 1 inch slices. Preheat large skillet to medium-high heat and pour in Canola oil. 3) Dip both sides of tofu slice in eggbeater mixture and then in flour mixed with salt & pepper (and other seasonings, if you wish). Place in hot oil in skillet. Cook each side till brown and crispy. About 5 minutes each side. 4) Remove and place on paper towel to drain excess oil. Makes about 4 large slices of fried tofu.